Four Go-To Outfit Formulas for This Season + Lily Jade GIVEAWAY! 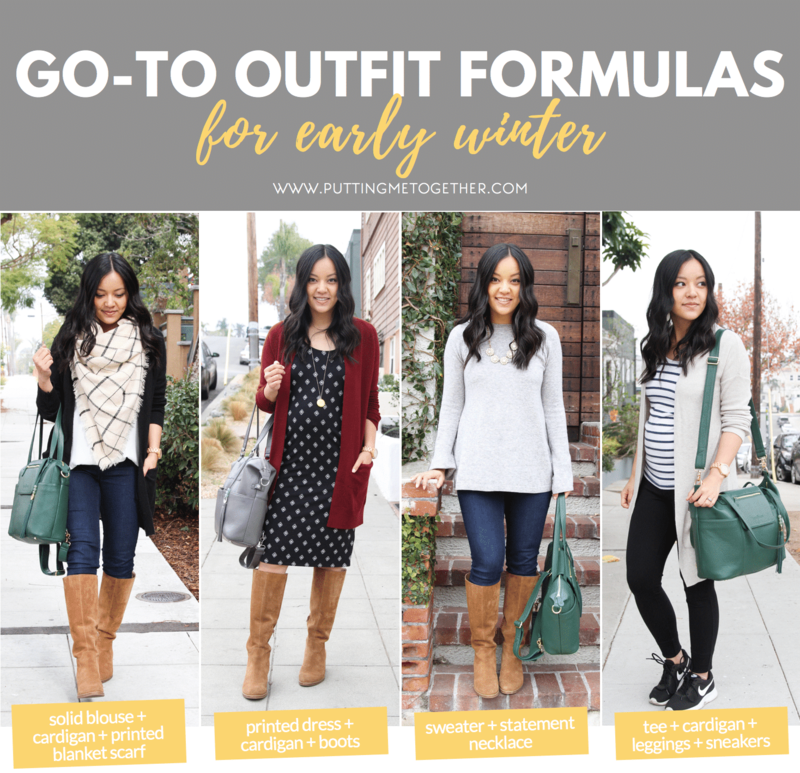 Ohhhh, you know I love a good go-to outfit formula! And how much more do I love them while pregnant and feeling even more limited in my wardrobe. 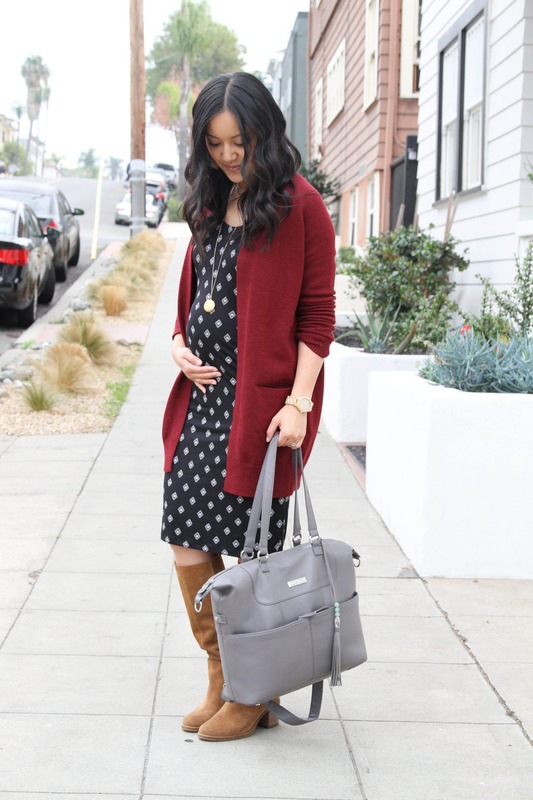 But, don’t worry if maternity style isn’t on your mind–these outfit formulas work whether you’re pregnant or not! 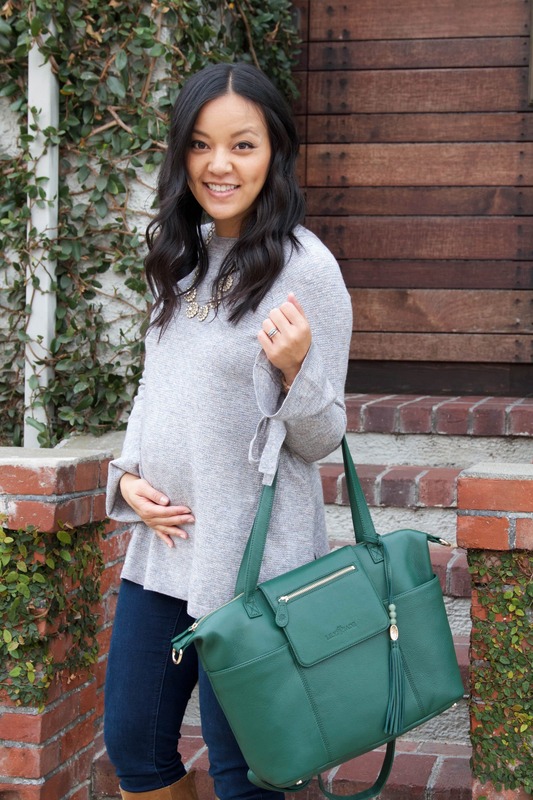 Today I’m partnering with Lily Jade again to show four easy go-to outfits that work whether you’ve got a baby bump or not, plus giving you a chance to win your own Lily Jade bag! Lily Jade bags are gorgeous leather bags that are timeless. They’re pricey, but they’re the kind of bag that will last a lifetime. 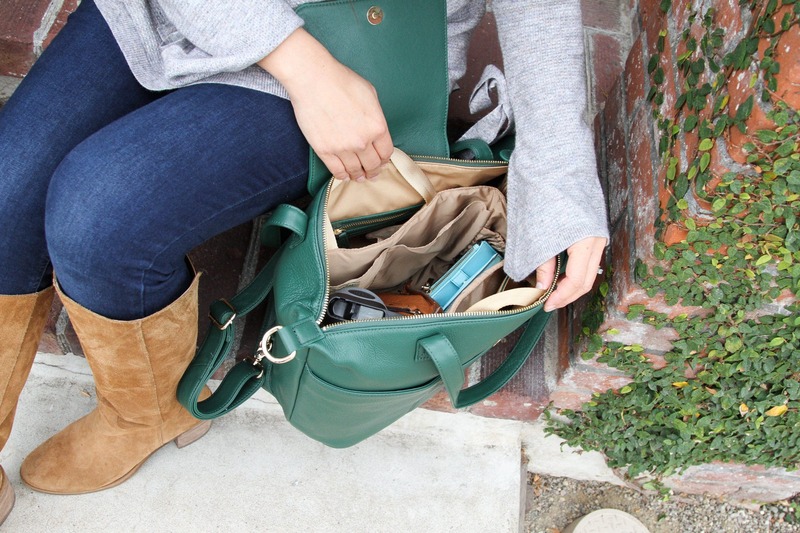 Oh, and get this–they’re diaper bags, but they convert flawlessly into regular bags when you don’t need a diaper bag. They really will last you a lifetime! Read all about them at the bottom of the post and enter the giveaway! This combo is super easy and pretty fuss-free. Throwing on a statement necklace or scarf totally polishes off this very simple combo. Any sweater will work printed or solid, but the more details it has the more interesting your outfit will be without having to put in more effort. 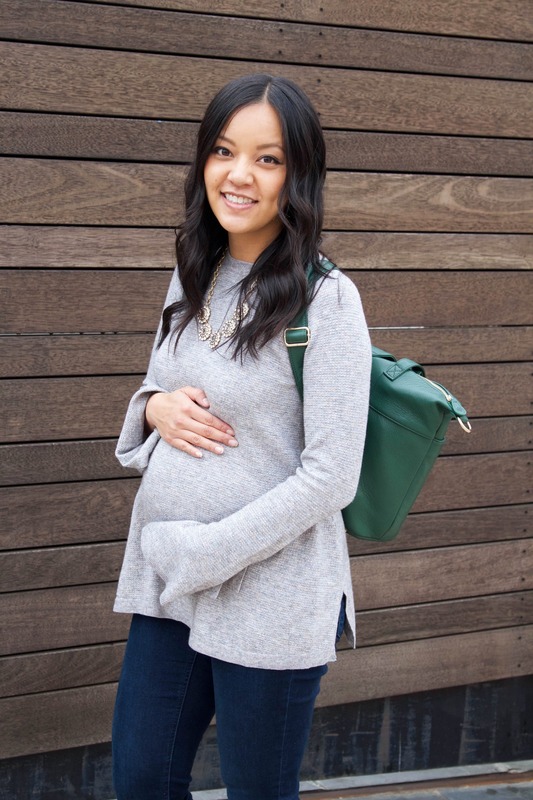 This cute maternity sweater is really soft and has fun little bell sleeves with bows on them! Most of the sizes aren’t available to ship, but you can see it HERE and hunt one down in stores–I got mine on clearance! There’s also a very similar non-maternity sweater from J.Crew Factory HERE. 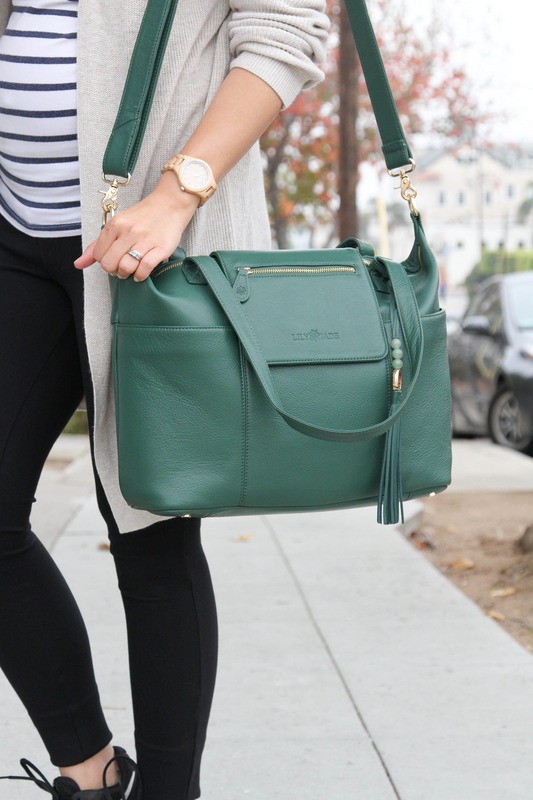 BTW, this magnolia green bag is a brand new limited edition color of the most popular Lily Jade bag, the Madeline! It’s got a pretty gold interior. In the shot above you can see the removable insert, which has tons and tons and tons of pockets for organizing anything you can imagine. The Madeline in the color Brandy was my first Lily Jade bag ever, and I got it when I was pregnant with Addie back in 2014. (See that post HERE just for kicks!) Feels full circle to be featuring the Madeline again in a new color when I’m pregnant with Baby #2! It’s got 3 deep pockets in the front that you can slip things into easily like your phone, snacks, or chapstick and other things you want to access quickly. This is an outfit formula that is nice to wear anytime, but I’m reallllyyyy appreciating while pregnant. 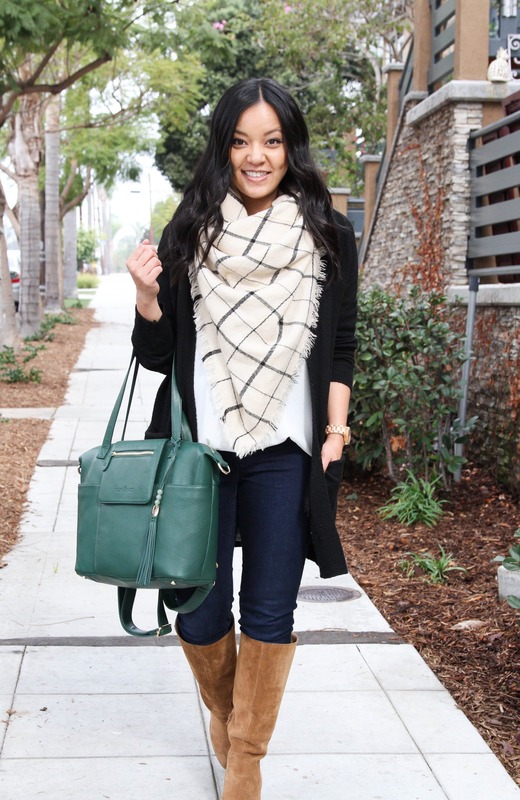 You can easily add a scarf for more warmth on colder days. I found these maternity ponte pants at Target, and while they have back pockets, they basically feel like leggings. It’s nice to have a thicker pair of leggings! I’ll do a fuller review of them soon, but for now you can see them HERE. Get my favorite non-maternity leggings HERE and read my review for them HERE. 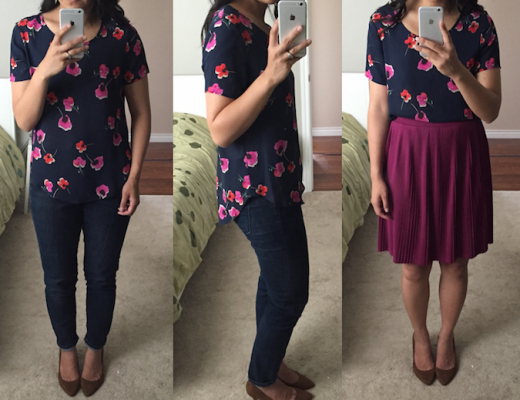 This is an outfit formula I’ve repeated over and over through out winter. In the fall I wear the formula without the blanket scarf, and in the winter I throw on a huge blanket scarf plus a coat. This white tunic is one I’ve worn over and over and over again (see it remixed in 10 outfits HERE), and thanks to it being super loose I’m wearing it comfortably at 25 weeks pregnant! You can do this combo with any color cardigan and solid top as it’ll be an easy backdrop for a printed blanket scarf. Also, I’ve gotta say I was iffy about the magnolia green bag first, but it’s totally grown on me and I actually love how it adds some oomph to all-neutral outfits! Oh goodness yall, this outfit is so comfy! 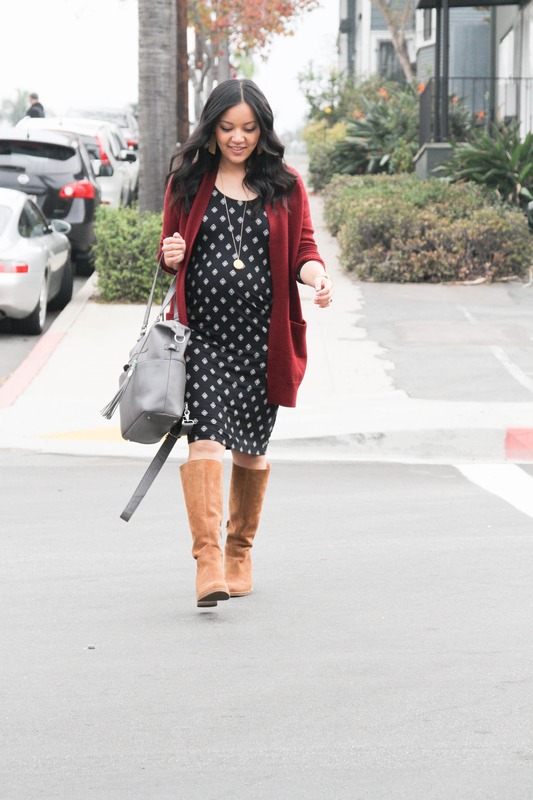 I wore this outfit combo on repeat last year too, just the non-maternity version. If you’ve been reading PMT for a bit you know when I’m not pregnant I’m a huuuuge fan of what I call “pajama dresses.” They are any dress made of super soft, super stretchy material that feels like you’re wearing pajamas–namely I wear THESE, but they can be any silhouette. It’s the material that matters more! Well, the dress I’m wearing is the ultra flattering maternity version of my favorite pajama dresses! It was sold out for a while but came back in stock in all sizes HERE! 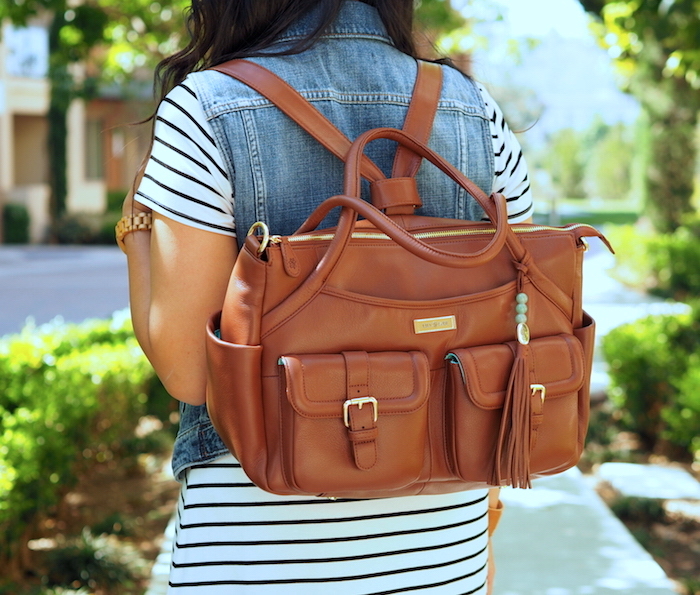 Ability to convert between shoulder bag, crossbody, and backpack. Hands free is THE BEST! They’re pretty great, and now you have a chance to win your own! Putting Me Together + Lily Jade Giveaway – January 2018! Fashion Finds #1 – Shade Clothing: Basics & Striped Blazer! And I love all these outfits and your bump 😄😍 so cute! I have the Lily Jade Madeline bag, which I enjoy but find that it doesn’t hold a ton of stuff. Do you remember how your Madeline compared to the other 3 bags in your comparison post in terms of how much stuff you could carry? In addition, I’ve come across two major problems with the bags that I’m wondering if you have experienced and come up with a solution. First, when I carry the bag as a backpack, it interferes with carrying my child on my hip. Her leg bumps up against the bag and makes me lose my grip on her. Since this is the most common way I wear the bag and carry her, it is quite cumbersome! Any thoughts? The second problem occurs when I have the strap threaded through the loop to make the backpack straps. There’s nothing there to keep each “strap” a uniform size to easily slip it onto shoulders one handed. If I grab one end, the whole strap slides through the loop, making the other side pull taut. Then I have to do a lot of funky adjusting in order to put it on, or put it on by holding each strap. If I have each hand holding on to an end of of the strap, I can’t put it on when I’m holding my daughter. Again, cumbersome. My solution has been to tie the straps in a knot around the loop (since I never wear it crossbody anyway), but it’s not my favorite. Have you ever experienced this? Am I doing something wrong? Hi Emma! I haven’t compared the Madeline to the other 3 yet. My husband made me minimize, so I had given away my original Madeline when I got the Rosie and didn’t have it during that post. So far I’m liking Shaylee’s size the best, which I didn’t have when I did the review of the other 3 bags. It’s taken the place of the Rosie for me in recent months, and I think it’s bigger than the Madeline, or at least it feels like it holds more! Haven’t done a thorough test yet, but since I have the two bags now I was thinking about doing one. For the backpack w/ the kid thing, no I haven’t run into that. Are you able to wear the backpack any higher and solve the problem? My kid is 3 now and I still pick her up with the backpack, but her legs don’t hit the backpack as they’re below it. I can’t remember days when she was younger and couldn’t hold herself up as well though. In those days I mostly wore the backpack and then wore her in a baby carrier in front. But I don’t recall being annoyed with the backpack/leg thing. To keep the straps from sliding, Lily Jade has a trick they use! It’s a way they knot or loop the strap into the top ring. I can’t explain it and I don’t know where their tutorial is. You could try tagging them on Instagram and asking them. I do it in this pic: https://www.puttingmetogether.com/wp-content/uploads/2017/06/stripeddressdenimvestsneakerslilyjadeelizabeth04.jpg. Totally keeps it from sliding. LOVE outfit formulas! I feel like in the winter I mostly wear a sweater or striped top with either a vest or cardigan (with the tees, not sweaters!). Then add necklace or scarf and riding boots if I’m leaving the house. (And pants, obviously.) By March-ish I’m ready to switch things up with the warmer weather but sure makes getting ready in the morning easier! Super cute! Will have to try a couple of these next week! Your Nike’s are on my list for this spring. We are planning a trip with a lot of walking and I wanted something comfy but stylish enough to wear with jeans and leggings. Going to hunt down your outfits with them for some inspiration. I have gotten more intentional with my shopping to only buy items that will help compete my wardrobe. I have trimmed down my fall winter closet by wearing everything in my closet, getting rid of items I do not love and don’t fit right and taking pics of myself to help me remember combinations! looking fwd to your review of the ponte knit pants/leggings bc I saw them and thought about getting them. btw, are those maternity jeggings just as comfy as the rockstars? debating on them but then saw that one reviewer who is the same height as me said they were too long. are they long on you? You look so comfortable and stylish! Congrats on your pregnancy!